I finally got around to go watch the Wolverine movie at the cinema after much procrastinating. The second installation of the adventures of James Logan aka the Wolverine sees Hugh Jackman reprise his role as the regenerative mutant with claws. This was one movie I just had to see considering the fact that the child in me had grown up with a steady stream of Marvel and DC Comics added to the Saturday morning filled Cartoon desserts (y'all remember Cadbury's Breakfast Television, don't cha). The movie sees a tortured Logan fresh of from the events of X-Men: Last Stand plagued by nightmares of Jean whom he had killed, living in the forest. 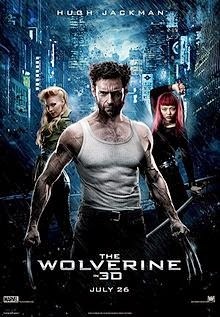 Logan is contacted by Yukio a precognitive mutant (she can see the future) and employee of Yashida (a soldier who was saved by Wolverine in Japan during the Second World War and had become Japan's richest man). Yashida had sent Yukio to fetch Wolverine so that he could say Thank you and bid him farewell (but he's ulterior motive was to use Wolverine regenerative powers to restore his youth and live forever). The movie was awesome with well coordinated the fight scenes. My favourite being the train action scene where Wolverine faces off with a member of the Yakuza on top of the train. The funeral scene was another good one. The final fight scene didn't make sense to me, I thought adamantium was supposed to be indestructible after it cools (don't tell me that energized nonsense, the physics doesn't add up). Overall it's a good movie to go watch at the cinema (This is a movie for action junkies). There are movies that require a large screen to actually enjoy, and this is one of them. If you watched movie courtesy a download on your mobile, you need to go watch it again. It costs just 500 Naira at FilmHouse Cinemas.